One of the joys of fishing new places is meeting the locals. While chasing the dream in Oso, Wash., earlier this week, my son and I were hailed by this hearty group at the town gas pump/lunch stop/tavern. 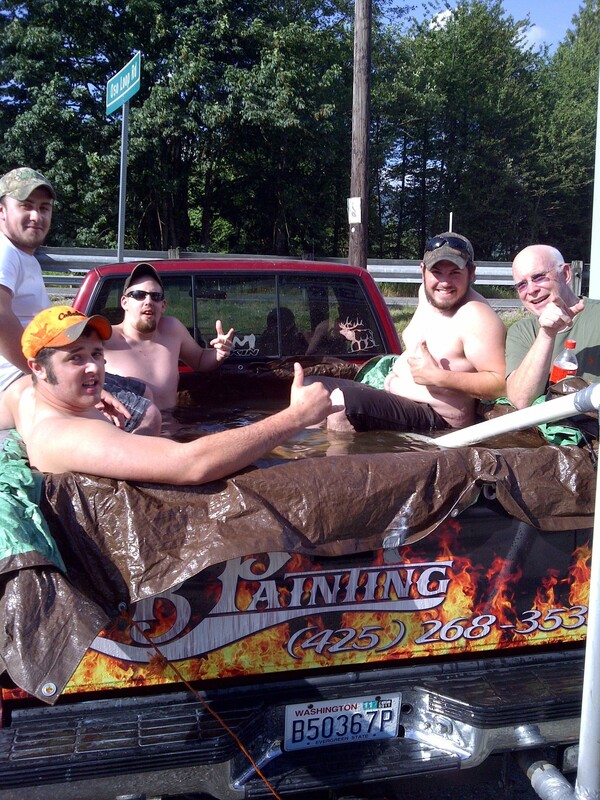 “Ever seen a hot tub in the back of a pickup?” one 20-something shouted from his seat in the water. These boys had rerouted the exhaust pipe with PVC to pour the hot fumes into the truck bed. It didn’t do much to heat the chilly water, but it did make for a crazy time (and a lot of carbon monoxide!). Hi. If people want to help the survivors of Saturday’s mudslide near Oso, there are some links on my blog at http://wildninjablog.com/2014/03/25/oso-aid/. Thank you!